It was founded as the Disney Brothers Cartoon Studio in 1923 and incorporated as Walt Disney Productions in 1929. The studio was exclusively dedicated to producing short films until it expanded into feature production in 1934. In 1983, Walt Disney Productions named its live action film studio Walt Disney Pictures. During a corporate restructuring in 1986, Walt Disney Productions was renamed The Walt Disney Company and the animation division, renamed Walt Disney Feature Animation, became a subsidiary of its film division, The Walt Disney Studios. In 2007, Walt Disney Feature Animation took on its current name, Walt Disney Animation Studios after Pixar was acquired by Disney in the same year. For much of its existence, the studio was recognized as the premier American animation studio; it developed many of the techniques, concepts and principles that became standard practices of traditional animation. The studio also pioneered the art of storyboarding, which is now a standard technique used in both animated and live-action filmmaking. The studio's catalog of animated features is among Disney's most notable assets, with the stars of its animated shorts – Mickey Mouse, Minnie Mouse, Donald Duck, Daisy Duck, Goofy and Pluto – becoming recognizable figures in popular culture and mascots for The Walt Disney Company as a whole. Walt Disney Animation Studios continues to produce films using both traditional animation and computer-generated imagery (CGI). Kansas City, Missouri, natives Walt Disney and Roy O. Disney founded the Disney Brothers Cartoon Studio in Los Angeles in 1923 and got their start producing a series of silent Alice Comedies short films featuring a live-action child actress in an animated world. The Alice Comedies were distributed by Margaret J. Winkler's Winkler Pictures, which later also distributed a second Disney short subject series, the all-animated Oswald the Lucky Rabbit, through Universal Pictures starting in 1927. Upon relocating to California, the Disney brothers initially started working in their uncle Robert Disney's garage at 4406 Kingswell Avenue in the Los Feliz neighborhood of Los Angeles, then in October 1923 formally launched their studio in a small office on the rear side of a real estate agency's office at 4651 Kingswell Avenue. In February 1924, the studio moved next door to office space of its own at 4649 Kingswell Avenue. In 1925, Disney put down a deposit on a new location at 2719 Hyperion Avenue in the nearby Silver Lake neighborhood, which came to be known as the Hyperion Studio to distinguish it from the studio's other locations, and in January 1926 the studio moved there and took on the name the Walt Disney Studio. Meanwhile, after the first year's worth of Oswalds, Walt Disney attempted to renew his contract with Winkler Pictures, but Charles Mintz, who had taken over Margaret Winkler's business after marrying her, wanted to force Disney to accept a lower advance payment for each Oswald short. Disney refused, and as Universal owned the rights to Oswald rather than Disney, Mintz set up his own animation studio to produce Oswald cartoons. Most of Disney's staff was hired away by Mintz to move over, once Disney's Oswald contract was done in mid-1928. Working in secret while the rest of the staff finished the remaining Oswalds on contract, Disney and his head animator Ub Iwerks led a small handful of loyal staffers in producing cartoons starring a new character named Mickey Mouse. The first two Mickey Mouse cartoons, Plane Crazy and The Galloping Gaucho, were previewed in limited engagements during the summer of 1928. For the third Mickey cartoon, however, Disney produced a soundtrack, collaborating with musician Carl Stalling and businessman Pat Powers, who provided Disney with his bootlegged "Cinephone" sound-on-film process. Subsequently, the third Mickey Mouse cartoon, Steamboat Willie, became Disney's first cartoon with synchronized sound and was a major success upon its November 1928 debut at the West 57th Theatre in New York City. The Mickey Mouse series of sound cartoons, distributed by Powers through Celebrity Productions, quickly became the most popular cartoon series in the United States. A second Disney series of sound cartoons, the Silly Symphonies, debuted in 1929 with The Skeleton Dance. In 1930, disputes over finances between Disney and Powers led to Disney's studio, reincorporated on December 16, 1929, as Walt Disney Productions, signing a new distribution contract with Columbia Pictures. Powers in return signed away Ub Iwerks, who began producing cartoons at his own studio although he would return to Disney in 1940. Columbia distributed Disney's shorts for two years before the Disney studio entered a new distribution deal with United Artists in 1932. The same year, Disney signed a two-year exclusive deal with Technicolor to utilize its new 3-strip color film process, which allowed for fuller-color reproduction where previous color film processors could not. The result was the Silly Symphony Flowers and Trees, the first film commercially released in full Technicolor. Flowers and Trees was a major success, and all Silly Symphonies were subsequently produced in Technicolor. By the early 1930s, Walt Disney had realized that the success of animated films depended upon telling emotionally gripping stories that would grab the audience and not let go, and this realization led him to create a separate "story department" with storyboard artists dedicated to story development. With well-developed characters and an interesting story, the 1933 Technicolor Silly Symphony cartoon Three Little Pigs became a major box office and pop culture success, with its theme song "Who's Afraid of the Big Bad Wolf?" becoming a popular chart hit. In 1934, Walt Disney gathered several key staff members and announced his plans to make his first feature animated film. Despite derision from most of the film industry, who dubbed the production "Disney's Folly," Disney proceeded undaunted into the production of Snow White and the Seven Dwarfs, which would become the first animated feature in English and Technicolor. Considerable training and development went into the production of Snow White and the Seven Dwarfs, and the studio greatly expanded with established animators, artists from other fields, and recent college graduates joining the studio to work on the film. The training classes, supervised by the head animators such as Les Clark, Norm Ferguson, and Art Babbit and taught by Donald W. Graham, an art teacher from the nearby Chouinard Art Institute, had begun at the studio in 1932 and were greatly expanded into orientation training and continuing education classes. In the course of teaching the classes, Graham and the animators created or formalized many of the techniques and processes that became the key tenets and principles of traditional animation. Silly Symphonies such as The Goddess of Spring (1934) and The Old Mill (1937) served as experimentation grounds for new techniques such as the animation of realistic human figures, special effects animation, the use of the multiplane camera, an invention which split animation artwork layers into several planes, allowing the camera to appear to move dimensionally through an animated scene. Snow White and the Seven Dwarfs cost Disney a then-expensive sum of $1.4 million to complete (including $100,000 on story development alone) and was an unprecedented success when released in February 1938 by RKO Radio Pictures, which had assumed distribution of Disney product from United Artists in 1937. It was briefly the highest-grossing film of all time before the success of Gone with the Wind two years later, grossing over $8 million on its initial release, the equivalent of $142,392,430 in 1999 dollars. During the production of Snow White, work had continued on the Mickey Mouse and Silly Symphonies series of shorts. Mickey Mouse switched to Technicolor in 1935, by which time the series had added several major supporting characters, among them Mickey's dog Pluto and their friends Donald Duck and Goofy. Donald, Goofy, and Pluto would all be appearing in series of their own by 1940, and the Donald Duck cartoons eclipsed the Mickey Mouse series in popularity. The Silly Symphonies, which garnered seven Academy Awards, ended in 1939. The success of Snow White allowed Disney to build a new, larger studio on Buena Vista Street in Burbank, where The Walt Disney Company remains headquartered to this day. Walt Disney Productions had its initial public offering on April 2, 1940, with Walt Disney as president and chairman and Roy Disney as CEO. The studio launched into the production of new animated features, the first of which was Pinocchio, released in February 1940. Pinocchio was not initially a box office success. The box office returns from the film's initial release were both below Snow White's unprecedented success and the studio's expectations. Of the film's $2.289 million cost – twice of Snow White – Disney only recouped $1 million by late 1940, with studio reports of the film's final original box office take varying between $1.4 million and $1.9 million. However, Pinocchio was a critical success, winning the Academy Award for Best Original Song and Best Original Score, making it the first film of the studio to win not only either Oscar, but both at the same time. Fantasia, an experimental film produced to an accompanying orchestral arrangement conducted by Leopold Stokowski, was released in November 1940 by Disney itself in a series of limited-seating roadshow engagements. The film cost $2 million to produce, and although the film earned $1.4 million in its roadshow engagements, the high cost ($85,000 per theater) of installing Fantasound placed Fantasia at an even greater loss than Pinocchio. RKO assumed distribution of Fantasia in 1941, later reissuing it in severely edited versions over the years. Despite its financial failure, Fantasia was the subject of two Academy Honorary Awards on February 26, 1942 – one for the development of the innovative Fantasound system used to create the film's stereoscopic soundtrack, and the other for Stokowski and his contributions to the film. Much of the character animation on these productions and all subsequent features until the late 1970s was supervised by a brain-trust of animators Walt Disney dubbed the "Nine Old Men," many of whom also served as directors and later producers on the Disney features: Frank Thomas, Ollie Johnston, Woolie Reitherman, Les Clark, Ward Kimball, Eric Larson, John Lounsbery, Milt Kahl, and Marc Davis. Other head animators at Disney during this period included Norm Ferguson, Bill Tytla, and Fred Moore. The development of the feature animation department created a caste system at the Disney studio: lesser animators (and feature animators in-between assignments) were assigned to work on the short subjects, while animators higher in status such as the Nine Old Men worked on the features. Concern over Walt Disney accepting credit for the artists' work as well as debates over compensation led to many of the newer and lower-ranked animators seeking to unionize the Disney studio. A bitter union strike began in May 1941, which was resolved without the angered Walt Disney's involvement in July and August of that year. As Walt Disney Productions was being set up as a union shop, Walt Disney and several studio employees were sent by the US government on a Good Neighbor policy trip to Central and South America. The Disney strike and its aftermath led to an exodus of several animation professionals from the studio, from top-level animators such as Art Babbitt and Bill Tytla to artists better known for their work outside the Disney studio such as Frank Tashlin, Maurice Noble, Walt Kelly, Bill Meléndez, and John Hubley. Hubley, with several other Disney strikers, went on to found the United Productions of America studio, Disney's key animation rival in the 1950s. Dumbo, in production during the midst of the animators' strike, premiered in October 1941 and proved to be a financial success. The simple film only cost $950,000 to produce, half the cost of Snow White and the Seven Dwarfs, less than a third of the cost of Pinocchio, and two-fifths of the cost of Fantasia. Dumbo eventually grossed $1.6 million during its original release. In August 1942, Bambi was released, and as with Pinocchio and Fantasia, did not perform well at the box office. Out of its $1.7 million budget, it only grossed $1.64 million. Production of full-length animated features was temporarily suspended after the release of Bambi. Given the financial failures of some of the recent features and World War II cutting off much of the overseas cinema market, the studio's financiers at the Bank of America would only loan the studio working capital if it temporarily restricted itself to shorts production. Then in-production features such as Peter Pan, Alice in Wonderland, and Lady and the Tramp were therefore put on hold until after the war. Other issues affecting the studio at the time included the drafting of several Disney animators to fight in World War II, and the necessity for the studio to focus on producing wartime content for the U.S. Army, particularly military training, and civilian propaganda films. From 1942 to 1943, 95 percent of the studio's animation output was for the military. During the war, Disney produced the live-action/animated military propaganda feature Victory Through Air Power (1943), and a series of Latin culture-themed shorts resulting from the 1941 Good Neighbor trip were compiled into two features, Saludos Amigos (1942) and The Three Caballeros (1944). Saludos and Caballeros set the template for several other 1940s Disney releases of "package films": low-budgeted films composed of animated short subjects with animated or live-action bridging material. These films were Make Mine Music (1946), Fun and Fancy Free (1947), Melody Time (1948), and The Adventures of Ichabod and Mr. Toad (1949). The studio also produced two features, Song of the South (1946) and So Dear to My Heart (1948), which used more expansive live-action stories which still included animated sequences and sequences combining live-action and animated characters. Shorts production continued during this period as well, with Donald Duck, Goofy, and Pluto cartoons being the main output accompanied by cartoons starring Mickey Mouse, Figaro, and in the 1950s, Chip 'n' Dale and Humphrey the Bear. In addition, Disney began reissuing the previous features, beginning with re-releases of Snow White in 1944, Pinocchio in 1945, and Fantasia in 1946. This led to a tradition of reissuing the Disney films every seven years, which lasted into the 1990s before being translated into the studio's handling of home video releases. The original Animation Building at the Walt Disney Studios in Burbank, California, the headquarters of the animation department from 1940 to 1984. In 1948, Disney returned to the production of full-length features with Cinderella, a full-length film based on the fairy tale by Charles Perrault. At a cost of nearly $3 million, the future of the studio depended upon the success of this film. Upon its release in 1950, Cinderella proved to be a box-office success, with the profits from the film's release allowing Disney to carry on producing animated features throughout the 1950s. Following its success, production on the in-limbo features Alice in Wonderland, Peter Pan, and Lady and the Tramp was resumed. In addition, an ambitious new project, an adaptation of the Brothers Grimm fairy tale "Sleeping Beauty" set to Tchaikovsky's classic score, was begun but took much of the rest of the decade to complete. Alice in Wonderland, released in 1951, met with a lukewarm response at the box office and was a sharp critical disappointment in its initial release. Peter Pan, released in 1953, was, on the other hand, a commercial success and the highest-grossing film of the year. In 1955, Lady and the Tramp was released to higher box office success than any other Disney feature from the studio since Snow White and the Seven Dwarfs, earning an estimated $7.5 million in rentals at the North American box office in 1955. Lady is significant as Disney's first widescreen animated feature, produced in the CinemaScope process, and was the first Disney animated feature to be released by Disney's own distribution company, Buena Vista Distribution. By the mid-1950s, with Walt Disney's attention primarily set on new endeavours such as live-action films, television, and the Disneyland theme park, production of the animated films was left primarily in the hands of the "Nine Old Men" trust of head animators and directors. This led to several delays in approvals during the production of Sleeping Beauty, which was finally released in 1959. At $6 million, it was Disney's most expensive film to date, produced in a heavily stylized art style devised by artist Eyvind Earle and presented in large-format Super Technirama 70 with six-track stereophonic sound. However, the film's large production costs and underperformance at the box office resulted in the studio posting its first annual loss in a decade for fiscal year 1960, leading to massive layoffs throughout the studio. By the end of the decade, the Disney short subjects were no longer being produced on a regular basis, with many of the shorts divisions' personnel either leaving the company or begin reassigned to work on Disney television programs such as The Mickey Mouse Club and Disneyland. While the Disney shorts had dominated the Academy Award for Best Short Subject (Cartoons) during the 1930s, its reign over the award had been ended by MGM's Tom and Jerry cartoons, Warner Bros' Looney Tunes and Merrie Melodies, and the works of United Productions of America (UPA), whose flat art style and stylized animation techniques were lauded as more modern alternatives to the older Disney style. During the 1950s, only one Disney short, the stylized Toot, Whistle, Plunk and Boom, won the Best Short Subject (Cartoons) Oscar. The Mickey Mouse, Pluto, and Goofy shorts had all ceased regular production by 1953, with Donald Duck and Humphrey continuing and converting to widescreen CinemaScope before the shorts division was shut down in 1956. After that, all future shorts were produced by the feature films division until 1969. The last Disney short of the golden age of animation was It's Tough to Be a Bird. Disney shorts would only be produced on a sporadic basis from this point on, with notable later shorts including Runaway Brain (1995, starring Mickey Mouse) and Paperman (2012). Despite the 1959 layoffs and competition for Walt Disney's attention from the company's grown live-action film, TV, and theme park departments, production continued on feature animation productions at a reduced level. In 1961, the studio released One Hundred and One Dalmatians, an animated feature which popularized the use of xerography during the process of inking and painting traditional animation cels. Using xerography, animation drawings could be photochemically transferred rather than traced from paper drawings to the clear acetate sheets ("cels") used in final animation production. The resulting art style – a scratchier line which revealed the construction lines in the animators' drawings – typified Disney films into the 1980s. The film was a success, being the tenth highest-grossing film of 1961 with rentals of $6.4 million. The Disney animation training program started at the studio before the development of Snow White in 1932 eventually led to Walt Disney helping found the California Institute of the Arts (CalArts). This university, formed via the merger of Chouinard Art Institute and the Los Angeles Conservatory of Music, included a Disney-developed animation program of study among its degree offerings. CalArts became the alma mater of many of the animators who would work at Disney and other animation studios from the 1970s to the present. The Sword in the Stone was released in 1963 and was the sixth highest-grossing film of the year in North America with estimated rentals of $4.75 million. A featurette adaptation of one of A. A. Milne's Winnie-the-Pooh stories, Winnie the Pooh and the Honey Tree, was released in 1966, to be followed by several other Pooh featurettes over the years and a full-length compilation feature, The Many Adventures of Winnie the Pooh, which was released in 1977. Walt Disney died in December 1966, ten months before the studio's next film The Jungle Book, was completed and released. The film was a success, finishing 1967 as the fourth highest-grossing film of the year. Following Walt Disney's death, Wolfgang Reitherman continued as both producer and director of the features. The studio began the 1970s with the release of The Aristocats, the last film project to be approved by Walt Disney. In 1971, Roy O. Disney, the studio co-founder, died and Walt Disney Productions was left in the hands of Donn Tatum and Card Walker, who alternated as chairman and CEO in overlapping terms until 1978. The next feature, Robin Hood (1973), was produced with a significantly reduced budget and animation repurposed from previous features. Both The Aristocats and Robin Hood were minor box office and critical successes. The Rescuers, released in 1977, was a success exceeding the achievements of the previous two Disney features. Receiving broad critical acclaim, commercial returns, and an Academy Award nomination, it ended up being the third highest-grossing film of the year and the most successful and acclaimed Disney animated film since The Jungle Book. The film was reissued in 1983, accompanied by a new Disney featurette, Mickey's Christmas Carol. The production of The Rescuers signaled the beginning of a changing of the guard process in the personnel at the Disney animation studio: as veterans such as Milt Kahl and Les Clark retired, they were gradually replaced by new talents such as Don Bluth, Ron Clements, John Musker, and Glen Keane. The new animators, culled from the animation program at CalArts and trained by Eric Larson, Frank Thomas, Ollie Johnston, and Woolie Reitherman got their first chances to prove themselves as a group with the animated sequences in Disney's live-action/animated hybrid feature Pete's Dragon (1977), the animation for which was directed by Bluth. In September 1979, dissatisfied with what they felt was a stagnation in the development of the art of animation at Disney, Bluth and several of the other new guard animators quit to start their own studio, Don Bluth Productions, which became Disney's chief competitor in the animation field during the 1980s. Delayed half a year by the defection of the Bluth group, The Fox and the Hound was released in 1981 after four years in production. The film was considered a financial success by the studio, and development continued on The Black Cauldron, a long-gestating adaptation of the Chronicles of Prydain series of novels by Lloyd Alexander produced in Super Technirama 70. The Black Cauldron was intended to expand the appeal of Disney animated films to older audiences and to showcase the talents of the new generation of Disney animators from CalArts. Besides Keane, Musker, and Clements, this new group of artists included other promising animators such as Andreas Deja, Mike Gabriel, John Lasseter, Brad Bird, and Tim Burton. Lasseter was fired from Disney in 1983 for pushing the studio to explore computer animation production, but went on to become the creative head of Pixar, a pioneering computer animation studio that would begin a close association with Disney in the late 1980s. Similarly, Burton was fired in 1984 after producing a live-action short shelved by the studio, Frankenweenie, then went on to become a high-profile producer and director of live-action and stop-motion features for Disney and other studios. Some of Burton's high-profile projects for Disney would include the stop-motion The Nightmare Before Christmas (1993), a live-action adaptation of Alice in Wonderland (2010), and a stop-motion feature remake of Frankenweenie (2012). Bird was also fired after working a few years at the company for criticizing Disney's upper management for playing it safe and not taking risks on animation. He subsequently became an animation director at other studios, including Warner Bros. Animation and Pixar. Roy E. Disney (Chairman, 1985–2003), nephew of Walt Disney, was a key figure in restructuring the animation department following the reorganization of the Disney company in 1984. Ron Miller, Walt Disney's son-in-law, became president of Walt Disney Productions in 1978 and CEO in 1983. That year, he expanded the company's film and television production divisions, creating the Walt Disney Pictures banner under which future films from the feature animation department would be released. After a series of corporate takeover attempts in 1984, Roy E. Disney, son of Roy O. and nephew of Walt, resigned from the company's board of directors and launched a campaign called "SaveDisney," successfully convincing the board to fire Miller. Roy E. Disney brought in Michael Eisner as Disney's new CEO and Frank Wells as president. Eisner in turn named Jeffrey Katzenberg chairman of the film division, The Walt Disney Studios. Near completion when the Eisner regime took over Disney, The Black Cauldron (1985) would come to represent what would later be referred to as the "rock bottom" point for Disney animation. The studio's most expensive feature to that point at $44 million, The Black Cauldron was a critical and commercial failure. The film's $21 million box office gross led to a loss for the studio, putting the future of the animation division in jeopardy. Between the 1950s and 1980s, the significance of animation to Disney's bottom line was significantly reduced as the company expanded into further live-action production, television, and theme parks. As new CEO, Michael Eisner strongly considered shuttering the feature animation studio and outsourcing future animation. Roy E. Disney intervened, offering to head the feature animation division and turn its fortunes around, while Eisner established the Walt Disney Pictures Television Animation Group to produce lower-cost animation for television. Named Chairman of feature animation by Eisner, Roy E. Disney appointed Peter Schneider president of animation to run the day-to-day operations in 1985. On February 1, 1985, Disney executives moved the animation division from the Disney studio lot in Burbank to a variety of warehouses, hangars, and trailers located about two miles east (3.2 kilometers) in nearby Glendale, California. The animation division's first feature animation at its new location was The Great Mouse Detective (1986), begun by John Musker and Ron Clements as Basil of Baker Street after both left production of The Black Cauldron. The film was enough of a critical and commercial success to instill executive confidence in the animation studio. Later the same year, however, Universal Pictures and Steven Spielberg's Amblin Entertainment released Don Bluth's An American Tail, which outgrossed The Great Mouse Detective at the box office and became the highest-grossing first-issue animated film to that point. Katzenberg, Schneider, and Roy Disney set about changing the culture of the studio, increasing staffing and production so that a new animated feature would be released every year instead of every two to four. The first of the releases on the accelerated production schedule was Oliver & Company (1988), which featured an all-star cast including Billy Joel and Bette Midler and an emphasis on a modern pop soundtrack. Oliver & Company opened in the theaters on the same day as another Bluth/Amblin/Universal animated film, The Land Before Time; however, Oliver outgrossed Time in the US and went on to become the most successful animated feature in the US to that date, though the later's worldwide box office gross was higher than the former. 1400 Flower Street in Glendale, California, one of several buildings used by Walt Disney Feature Animation between 1985 and 1995. 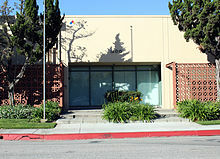 1400 Air Way, another Glendale building used by Walt Disney Feature Animation between 1985 and 1995. At the same time in 1988, Disney's started entering into Australia's long-standing animation industry, by purchasing Hanna-Barbera's Australian studio to start Disney Animation Australia. While Oliver & Company and the next feature The Little Mermaid were in production, Disney collaborated with Steven Spielberg's Amblin Entertainment and master animator Richard Williams to produce Who Framed Roger Rabbit, a groundbreaking live-action/animation hybrid directed by Robert Zemeckis, which featured licensed animated characters from other animation studios. Disney set up a new animation studio under Williams' supervision in London to create the cartoon characters for Roger Rabbit, with many of the artists from the California studio traveling to England to work on the film. A significant critical and commercial success, Roger Rabbit won three Academy Awards for technical achievements. and was key in renewing mainstream interest in American animation. Other than the film itself, the studio also produced three Roger Rabbit shorts during the late 1980s and early 1990s. A second satellite studio, Walt Disney Feature Animation Florida, opened in 1989 with 40 employees. Its offices were located within the Disney-MGM Studios theme park at Walt Disney World in Bay Lake, Florida, and visitors were allowed to tour the studio and observe animators at work. That same year, the studio released The Little Mermaid, which became a keystone achievement in Disney's history as its largest critical and commercial success in decades. Directed by John Musker and Ron Clements, who'd been co-directors on The Great Mouse Detective, The Little Mermaid earned $84 million at the North American box office, a record for the studio. The film was built around a score from Broadway songwriters Alan Menken and Howard Ashman, who was also a co-producer and story consultant on the film. The Little Mermaid won two Academy Awards, for Best Original Song and for Best Original Score. The Little Mermaid vigorously relaunched a profound new interest in the animation and musical film genres. The film was also the first to feature the use of Disney's Computer Animation Production System (CAPS). Developed for Disney by Pixar, which had grown into a commercial computer animation and technology development company, CAPS/ink & paint would become significant in allowing future Disney films to more seamlessly integrate computer-generated imagery and achieve higher production values with digital ink and paint and compositing techniques. The Little Mermaid was the first of a series of blockbusters that would be released over the next decade by Walt Disney Feature Animation, a period later designated by the term Disney Renaissance. Accompanied in theaters by the Mickey Mouse featurette The Prince and the Pauper, The Rescuers Down Under (1990) was Disney's first animated feature sequel and the studio's first film to be fully colored and composited via computer using the CAPS/ink & paint system. However, the film did not duplicate the success of The Little Mermaid. The next Disney animated feature, Beauty and the Beast, had begun production in London but was moved back to Burbank after Disney decided to shutter the London satellite office and retool the film into a musical-comedy format similar to The Little Mermaid. Alan Menken and Howard Ashman were retained to write the song score, though Ashman died before production was completed. Debuting first in a work-in-progress version at the 1991 New York Film Festival before its November 1991 wide release, Beauty and the Beast, directed by Kirk Wise and Gary Trousdale, was an unprecedented critical and commercial success, and would later be seen as one of the studio's best films. The film earned six Academy Award nominations, including one for Best Picture, a first for an animated work, winning for Best Song and Best Original Score. Its $145 million box office gross set new records and merchandising for the film – including toys, cross-promotions, and soundtrack sales – was also lucrative. The successes of The Little Mermaid and Beauty and the Beast established the template for future Disney releases during the 1990s: a musical-comedy format with Broadway-styled songs and tentpole action sequences, buoyed by cross-promotional marketing and merchandising, all carefully designed to pull audiences of all ages and types into theatres. In addition to John Musker, Ron Clements, Kirk Wise, and Gary Trousdale, the new guard of Disney artists creating these films included story artists/directors Roger Allers, Rob Minkoff, Chris Sanders, and Brenda Chapman, and lead animators Glen Keane, Andreas Deja, Eric Goldberg, Nik Ranieri, Will Finn, and many others. Aladdin, released in November 1992, continued the upward trend in Disney's animation success, earning $504 million worldwide at the box office, and two more Oscars for Best Song and Best Score. Featuring songs by Menken, Ashman, and Tim Rice (who replaced Ashman after his passing) and starring the voice of Robin Williams, Aladdin also established the trend of hiring celebrity actors and actresses to provide the voices of Disney characters, which had been explored to some degree with The Jungle Book and Oliver & Company, but now became standard practice. In June 1994, Disney released The Lion King, directed by Roger Allers and Rob Minkoff. An all-animal adventure set in Africa, The Lion King featured an all-star voice cast which included James Earl Jones, Matthew Broderick, and Jeremy Irons, with songs written by Tim Rice and pop star Elton John. The Lion King earned $768 million at the worldwide box office, to this date a record for a traditionally animated film, earning millions more in merchandising, promotions, and record sales for its soundtrack. 622/610 Circle 7 Drive (the Hart-Dannon Building), another Glendale building used by Walt Disney Feature Animation during the early 1990s. Aladdin and The Lion King had been the highest-grossing films worldwide in each of their respective release years. Between these in-house productions, Disney diversified in animation methods and produced The Nightmare Before Christmas with former Disney animator Tim Burton. With animation becoming again an increasingly important and lucrative part of Disney's business, the company began to expand its operations. The flagship California studio was split into two units and expanded, and ground was broken on a new Disney Feature Animation building adjacent to the main Disney lot in Burbank, which was dedicated in 1995. The Florida satellite, officially incorporated in 1992, was expanded as well, and one of Disney's television animation studios in the Paris, France suburb of Montreuil – the former Brizzi Brothers studio – became Walt Disney Feature Animation Paris, where A Goofy Movie (1995) and significant parts of later Disney films were produced. Also, Disney began producing lower cost direct to video sequels for its successful animated films using the services of its television animation studios under the name Disney MovieToons. The Return of Jafar (1994), a sequel to Aladdin and a pilot for the Aladdin television show spin-off, was the first of these productions. Walt Disney Feature Animation was also heavily involved in the adaptations of both Beauty and the Beast in 1994 and The Lion King in 1997 into Broadway musicals. Jeffrey Katzenberg and the Disney story team were heavily involved in the development and production of Toy Story, the first fully computer-animated feature ever produced. Toy Story was produced for Disney by Pixar and directed by former Disney animator John Lasseter, whom Peter Schneider had unsuccessfully tried to hire back after his success with Pixar shorts such as Tin Toy (1988). Released in 1995, Toy Story opened to critical acclaim and commercial success, leading to Pixar signing a five-film deal with Disney, which bore critically and financially successful computer animated films such as A Bug's Life (1998), Toy Story 2 (1999), Monsters, Inc. (2001), and Finding Nemo (2003). In addition, the successes of Aladdin and The Lion King spurred a significant increase in the number of American-produced animated features throughout the rest of the decade, with the major film studios establishing new animation divisions such as Fox Animation Studios, Sullivan Bluth Studios, Rich Animation Studios, Turner Feature Animation, and Warner Bros. Animation being formed to produce films in a Disney-esque musical-comedy format such as Thumbelina (1994), The Swan Princess (1994), A Troll in Central Park (1994), Cats Don't Dance (1997), Anastasia (1997), Quest for Camelot (1998) and The King and I (1999). Out of these non-Disney animated features, only Anastasia was a box-office success. Walt Disney Feature Animation logo, used from 1997 to 2006. Concerns arose internally at Disney, particularly from Roy E. Disney, about studio chief Jeffrey Katzenberg taking too much credit for the success of Disney's early 1990s releases. Disney president Frank Wells was killed in a helicopter accident in 1994, and Katzenberg lobbied CEO Michael Eisner for the vacant president position. Instead, tensions between Katzenberg, Eisner, and Disney resulted in Katzenberg being forced to resign from the company that August 24, with Joe Roth taking his place. On October 12, 1994, Katzenberg went on to become one of the founders of DreamWorks SKG, whose animation division became Disney's key rival in feature animation with both computer animated films such as Antz (1998), and traditionally animated films such as The Prince of Egypt (1998). In December 1994, the Animation Building in Burbank was completed for the animation division. In contrast to the early 1990s productions, the mid-1990s Disney animated features presented a trend of diminishing returns. Pocahontas, released in summer 1995, was a critical and commercial disappointment compared to its predecessors, earning $346 million worldwide while still winning two Academy Awards for its music by Alan Menken and Stephen Schwartz. The next film, The Hunchback of Notre Dame (1996), partially produced at the Paris studio, performed better critically and grossed $325 million worldwide. The following summer, Hercules, grossed $252 million worldwide and received positive reviews, but it was responsible for beginning the decline of traditional animated films. The declining box office success became doubly concerning inside the studio as wage competition from DreamWorks had significantly increased the studio's overhead, with production costs increasing from $79 million in total costs (production, marketing, and overhead) for The Lion King in 1994 to $179 million for Hercules three years later. Moreover, Disney depended upon the popularity of its new features in order to develop merchandising, theme park attractions, direct-to-video sequels, and television programming in its other divisions. The production schedule was scaled back, and a larger number of creative executives were hired to more closely supervise production, a move that was not popular among the animation staff. Mulan (1998), the first film produced primarily at the Florida studio, earned $305 million in worldwide box office. The next summer's Tarzan, directed by Kevin Lima and Chris Buck, had a high production cost of $130 million, but earned $448 million at the box office. The Tarzan song score by pop star Phil Collins resulted in significant record sales and an Academy Award for Best Song. In October 1999, Dream Quest Images, a special effects studio previously purchased by The Walt Disney Company in April 1996 to replace Buena Vista Visual Effects, was merged with the computer-graphics operation of Walt Disney Feature Animation to form a division called The Secret Lab. The Secret Lab produced one feature film, Dinosaur, which was released in May 2000 and featured CGI prehistoric creatures against filmed live-action backgrounds. The $128 million production earned $349 million worldwide, below studio expectations, and the Secret Lab was closed in 2001. Fantasia 2000, a sequel to the 1940 film that had been a pet-project of Roy E. Disney's since 1990, was released on January 1, 2000. Produced in pieces when artists were available between productions, Fantasia 2000 was the first animated feature produced for and released in IMAX format. A standard theatrical release followed in June, but the film's $90 million worldwide box office total against its $90 million production cost resulted in it losing $100 million for the studio. Peter Schneider left his post as president of Walt Disney Feature Animation in 1999 to become president of The Walt Disney Studios under Joe Roth. Thomas Schumacher, who had been Schneider's vice president of animation for several years, became the new president of Walt Disney Feature Animation. By this time, competition from other studios had driven animators' incomes to all-time highs, making traditionally animated features even more costly to produce. Schumacher was tasked with cutting costs, and massive layoffs began to cut salaries and bring the studio's staff – which peaked at 2,200 people in 1999 – down to approximately 1,200 employees. In December 2000, The Emperor's New Groove was released. It had been a musical epic called Kingdom of the Sun before being revised mid-production into a smaller comedy, The film earned $169 million worldwide when released, though it was well-reviewed and performed better on video. Atlantis: The Lost Empire (2001), an attempt to break the Disney formula by moving into action-adventure, received mixed reviews and earned $186 million worldwide against production costs of $120 million. By 2001, the notable successes of computer-animated films from Pixar and DreamWorks such as Monsters, Inc. and, Shrek, respectively, against Disney's lesser returns for The Emperor's New Groove and Atlantis: The Lost Empire led to a growing perception that hand-drawn animation was becoming outdated and falling out of fashion. In March 2002, just after the successful release of Blue Sky Studios' computer-animated feature Ice Age, Disney laid off most of the employees at the Feature Animation studio in Burbank, downsizing it to one unit and beginning plans to move into fully computer animated films. A handful of employees were offered positions doing computer animation. Morale plunged to a low not seen since the start of the studio's ten-year exile to Glendale in 1985. The Paris studio was also closed in 2003. The Burbank studio's remaining hand-drawn productions, Treasure Planet and Home on the Range, continued production. Treasure Planet, an outer space retelling of Robert Louis Stevenson's Treasure Island, was a pet project of writer-directors Ron Clements and John Musker. It received an IMAX release and generally positive reviews but was financially unsuccessful upon its November 2002 release, resulting in a $74 million write-down for The Walt Disney Company in fiscal year 2003. The Burbank studio's 2D departments closed at the end of 2002 following completion of Home on the Range, a long-in-production feature that had been known as Sweating Bullets. Meanwhile, hand-drawn feature animation production continued at the Feature Animation Florida studio, where the films could be produced at lower costs. Lilo & Stitch, an offbeat comedy-drama written and directed by Chris Sanders and Dean DeBlois, became the studio's first bonafide hit since Tarzan upon its summer 2002 release, earning $273 million worldwide against a $80 million production budget. By this time, most of the Disney features from the 1990s had been spun off into direct-to-video sequels, television series, or both, produced by the Disney Television Animation unit. Beginning with the February 2002 release of Return to Never Land, a sequel to Peter Pan (1953), Disney began releasing lower-budgeted sequels to earlier films, which had been intended for video premieres, in theaters, a process derided by some of the Disney animation staff and fans of the Disney films. In 2003, Tom Schumacher was appointed president of Buena Vista Theatrical Group, Disney's stageplay and musical theater arm, and David Stainton, then president of Walt Disney Television Animation, was appointed as his replacement. Stainton continued to oversee Disney's direct-to-video division, Disneytoon Studios, which had been part of the television animation department, though transferred at this time to Walt Disney Feature Animation management. Under Stainton, the Florida studio completed Brother Bear, which did not perform as well as Lilo & Stitch critically or financially. Disney announced the closing of the Florida studio on January 12, 2004, with the then in-progress feature My Peoples left unfinished when the studio closed two months later. Upon the unsuccessful April 2004 release of Home on the Range, Disney, led by executive Bob Lambert, officially announced its conversion of Walt Disney Feature Animation into a fully CGI studio – a process begun two years prior – now with a staff of 600 people and began selling off all of its traditional animation equipment. Just after Brother Bear's November 2003 release, Feature Animation chairman Roy E. Disney had resigned from The Walt Disney Company, launching with business partner Stanley Gold a second external "SaveDisney" campaign similar to the one that had forced Ron Miller out in 1984, this time to force out Michael Eisner. Two of their arguing points against Eisner included his handling of Feature Animation and the souring of the studio's relationship with Pixar. Talks between Eisner and Pixar CEO Steve Jobs over renewal terms for the highly lucrative Pixar-Disney distribution deal broke down in January 2004. Jobs in particular disagreed with Eisner's insistence that sequels such as the then in-development Toy Story 3 (2010) would not count against the number of films required in the studio's new deal. To that end, Disney announced the launching of Circle 7 Animation, a division of Feature Animation which would have produced sequels to the Pixar films, while Pixar began shopping for a new distribution deal. In 2005, Disney released its first fully computer-animated feature, Chicken Little. The film was a moderate success at the box office, earning $315 million worldwide, but was not well-received critically. Later that year, after two years of Roy E. Disney's "SaveDisney" campaign, Eisner announced that he would resign and named Bob Iger, then president of The Walt Disney Company, his successor as chairman and CEO. John Lasseter (Chief Creative Officer, 2006-2018, left) and Edwin Catmull (President, 2006-2018, right) came to Disney following its acquisition of Pixar and dedicated themselves to revitalizing Walt Disney Animation Studios after the studio's unsuccessful early 2000s period. With Iger in place as the new CEO of Disney, Steve Jobs resumed negotiations for Pixar with Disney. On January 24, 2006, Disney announced that it would acquire Pixar for $7.4 billion in all stock deal, with the deal closing that May. and the Circle 7 studio launched to produce Toy Story 3 was shut down, with most of its employees returning to Feature Animation and Toy Story 3 returning to Pixar's control. As part of the acquisition, Edwin Catmull and John Lasseter were named President and Chief Creative Officer, respectively, of Feature Animation as well as Pixar. While Disney executives had discussed closing Feature Animation as redundant, Catmull and Lasseter refused and instead resolved to try to turn things around at the studio. Lasseter said "we weren't going to let that [closure] happen on our watch. We were determined to save the legacy of Walt Disney's amazing studio and bring it back up to the creative level it had to be. Saving this heritage was squarely on our shoulders." Lasseter and Catmull set about rebuilding the morale of the Feature Animation staff, and rehired a number of its 1980s "new guard" generation of star animators who had left the studio, including Ron Clements, John Musker, Eric Goldberg, Mark Henn, Andreas Deja, Bruce W. Smith, and Chris Buck. To maintain the separation of Feature Animation and Pixar despite their now common ownership and management, Catmull and Lasseter "drew a hard line" that each studio was solely responsible for its own projects and would not be allowed to borrow personnel from or lend tasks out to the other. Catmull said that he and Lasseter "make sure the studios are quite distinct from each other. We don’t want them to merge; that would definitely be the wrong approach. Each should have its own personality." Catmull and Lasseter also brought to Feature Animation the Pixar model of a "filmmaker-driven studio" as opposed to an "executive-driven studio"; they abolished Disney's prior system of requiring directors to respond to "mandatory" notes from development executives ranking above the producers in favor of a system roughly analogous to peer review, in which non-mandatory notes come primarily from fellow producers, directors, and writers. Most of the layers of "gatekeepers" (midlevel executives) were stripped away, and Lasseter established a routine of personally meeting weekly with filmmakers on all projects in the last year of production and delivering feedback on the spot. The studio's team of top creatives who work together closely on the development of its films is known as the Disney Story Trust; it is somewhat similar to the Pixar Braintrust, but its meetings are reportedly "more polite" than those of its Pixar counterpart. The studio released Meet the Robinsons in 2007, its second all-CGI film, earning $169.3 million worldwide. That same year, Disneytoon Studios was also restructured and began to operate as a separate unit under Lasseter and Catmull's control. Lasseter's direct intervention with the studio's next film, American Dog, resulted in the departure of director Chris Sanders, who went on to become a director at DreamWorks Animation. The film was retooled by new directors Byron Howard and Chris Williams as Bolt, which was released in 2008 and had the best critical reception of any Disney animated feature since Lilo & Stitch, and became a moderate financial success, receiving an Academy Award nomination for Best Animated Film. The Princess and the Frog, directed by Ron Clements and John Musker, was the studio's first hand-drawn animated film in five years. A return to the musical-comedy format of the 1990s with songs by Randy Newman, the film was released in 2009 to a positive critical reception and was also nominated for three Academy Awards, including two for Best Song. The box office performance of The Princess and the Frog – a total of $267 million earned worldwide against a $105 million production budget – was seen as an underperformance due to competition with Avatar. In addition, the "Princess" aspect of the title was blamed, resulting in future Disney films then in production about princesses being given neutral/symbolic titles: Rapunzel became Tangled and The Snow Queen became Frozen. In 2014, Disney animator Tom Sito compared the film's box office performance to that of The Great Mouse Detective (1986), which was a step-up from the theatrical run of the 1985 film The Black Cauldron. In 2009, the studio also produced the computer-animated Prep & Landing holiday special for the ABC television network. At the D23 Expo in 2009, Guillermo del Toro's Double Dare You production company and Disney announced a production deal for a line of darker animated films. The label was announced with one original animated project, Trollhunters. However, del Toro moved his deal to DreamWorks in late 2010. After The Princess and the Frog, the studio released Tangled, a musical CGI adaptation of the Brothers Grimm fairy tale "Rapunzel" with songs by Alan Menken and Glenn Slater. In active development since 2002 under Glen Keane, Tangled, directed by Byron Howard and Nathan Greno, was released in 2010 and became a significant critical and commercial success, and was nominated for several accolades. The film earned $591 million in worldwide box office revenue, becoming the studio's third most successful release to date. The hand-drawn feature Winnie the Pooh, a new feature film based on the A.A. Milne characters, followed in 2011 to positive reviews, but underperformed at the box office; it remains to date the studio's most recent hand-drawn feature. The film was released in theaters alongside the hand-drawn short The Ballad of Nessie. Wreck-It Ralph, directed by Rich Moore, was released in 2012, to critical acclaim and commercial success. A comedy-adventure about a video-game villain who redeems himself as a hero, it won numerous awards, including the Annie, Critics' Choice, and Kids' Choice Awards for Best Animated Feature Film and received Golden Globe and Academy Award nominations. The film earned $471 million in worldwide box office revenue. In addition, the studio won its first Academy Award for a short film in forty-four years with Paperman, which was released in theaters with Wreck-It Ralph. Directed by John Kahrs, Paperman utilized new software developed in-house at the studio called Meander, which merges hand-drawn and computer animation techniques within the same character to create a unique "hybrid." According to Producer Kristina Reed, the studio is continuing to develop the technique for future projects, including an animated feature. In 2013, the studio laid off nine of its hand-drawn animators, including Nik Ranieri and Ruben A. Aquino, leading to speculation on animation blogs that the studio was abandoning traditional animation, an idea that the studio dismissed. That same year, Frozen, a CGI musical film inspired by Hans Christian Andersen's "The Snow Queen", was released to widespread acclaim and became a blockbuster hit. Directed by Chris Buck and Jennifer Lee with songs by the Broadway team of Robert Lopez & Kristen Anderson-Lopez, it was the first Disney animated film to earn over $1 billion in worldwide box office revenue and is currently the highest-grossing animated film of all time, surpassing Pixar's Toy Story 3. Frozen also became the first film from Walt Disney Animation Studios to win the Academy Award for Best Animated Feature (a category started in 2001), as well as the first feature-length motion picture from the studio to win an Academy Award since Tarzan and the first to win multiple Academy Awards since Pocahontas. It was released in theaters with Get a Horse!, a new Mickey Mouse cartoon combining black-and-white hand-drawn animation and full-color CGI animation. The studio's next feature, Big Hero 6, a CGI comedy-adventure film inspired by the Marvel Comics series of the same name, was released in 2014. For the film, the studio developed new light rendering software called Hyperion, which the studio continued to use on all subsequent films. Big Hero 6 received critical acclaim and was the highest-grossing animated film of 2014, also winning the Academy Award for Best Animated Feature. The film was accompanied in theaters by the animated short Feast, which won the Academy Award for Best Animated Short Film. In March 2016, the studio released Zootopia, a CGI buddy-comedy film set in a modern world inhabited by anthropomorphic animals. The film was a critical and commercial success, grossing over $1 billion worldwide, and won the Academy Award for Best Animated Feature. Moana, a CGI fantasy-adventure film, was released in November 2016. The film was shown in theaters with the animated short Inner Workings. Moana was another commercial and critical success for the studio, grossing over $600 million worldwide and receiving two Academy Award nominations. In November 2017, John Lasseter announced that he was taking a six-month leave of absence after acknowledging "missteps" in his behavior with employees in a memo to staff. According to various news outlets, Lasseter had a history of alleged sexual misconduct towards employees. On June 8, 2018, it was announced that Lasseter would leave Disney and Pixar at the end of the year, but would take on a consulting role until then. Jennifer Lee was announced as Lasseter's replacement as chief creative officer of Disney Animation on June 19, 2018. On June 28, 2018, the studio's division Disneytoon Studios was shut down, resulting in the layoffs of 75 animators and staff. On October 23, 2018, it was announced that Ed Catmull would be retiring at the end of the year, and will stay in an adviser role until July 2019. In November 2018, the studio released a sequel to Wreck-It Ralph, titled Ralph Breaks the Internet. The film grossed over $500 million worldwide and received nominations for a Golden Globe and a Academy Award, both for Best Animated Feature. Walt Disney Animation Studios is currently managed by Jennifer Lee (Chief Creative Officer), and Andrew Millstein (President and General Manager). Former presidents of the studio include Edwin Catmull (June 2007 – December 2018), David Stainton (January 2003 – January 2006), Thomas Schumacher (January 2000 – December 2002) and Peter Schneider (1985 – December 1999). Other Disney executives who also exercised much influence within the studio were John Lasseter (2006–2018, Chief Creative Officer, Walt Disney Animation Studios), Roy E. Disney (1985–2003, Chairman, Walt Disney Feature Animation), Jeffrey Katzenberg (1984–94, Chairman, The Walt Disney Studios), Michael Eisner (1984–2005, CEO, The Walt Disney Company), and Frank Wells (1984–94, President and COO, The Walt Disney Company). Following Roy Disney's passing in 2009, the WDAS headquarters in Burbank was re-dedicated as The Roy E. Disney Animation Building in May 2010. The south side of the Roy E. Disney Animation Building, as seen from the public park that separates it from the Ventura Freeway. Since 1995, Walt Disney Animation Studios has been headquartered in the Roy E. Disney Animation Building in Burbank, California, across Riverside Drive from The Walt Disney Studios, where the original Animation building (now housing corporate offices) is located. 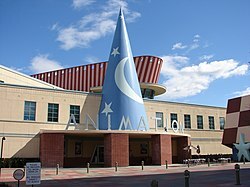 The Disney Animation Building's lobby is capped by a large version of the famous hat from the Sorcerer's Apprentice segment of Fantasia (1940), and the building is informally called the "hat building" for that reason. Disney Animation shares its site with ABC Studios, whose building is located immediately to the west. Until the mid-1990s, Disney Animation previously operated out of the Air Way complex, a cluster of old hangars, office buildings, and trailers in the Grand Central Business Centre, an industrial park on the site of the former Grand Central Airport about two miles (3.2 km) east in the city of Glendale. The Disneytoon Studios unit was based in Glendale. Disney Animation's archive, formerly known as "the morgue" (based on an analogy to a morgue file) and today known as the Animation Research Library, is also located in Glendale. Unlike the Burbank buildings, the ARL is located in a nondescript office building near Disney's Grand Central Creative Campus. The 12,000-square-foot ARL is home to over 64 million items of animation artwork going back to 1924; because of its importance to the company, it requires visitors to agree to not disclose its exact location within Glendale. Previously, feature animation satellite studios were located around the world in Montreuil, Seine-Saint-Denis, France (a suburb of Paris), and in Bay Lake, Florida (near Orlando, at Disney's Hollywood Studios, one of the four theme parks at Walt Disney World). The Paris studio was shut down in 2002, while the Florida studio was shut down in 2004. The Florida animation building survives as an office building, while the former Magic of Disney Animation section of the building is home to Star Wars Launch Bay. In November 2014, Disney Animation commenced a 16-month upgrade of the Roy E. Disney Animation Building, in order to fix what Catmull had called its "dungeon-like" interior. For example, the interior was so cramped that it could not easily accommodate "town hall" meetings with all employees in attendance. Disney did not disclose the renovation's cost, but then-chief creative officer John Lasseter revealed that "[t]he whole center of the second floor will have an atrium that will go up two stories[;] we want to make this building so beautiful that it's worthy of the artistic talent that's there." In addition, it was revealed that the large sorcerer's hat would become the building's main entrance. Lasseter stated, "There will be a gorgeous stairway that goes up into the hat, it's a really great symbol like you're entering the building through the magic of Mickey Mouse's hat." Due to the renovation, the studio's employees were temporarily moved from Burbank into the closest available Disney-controlled studio space – the Disneytoon Studios building in the industrial park in Glendale and the old Imagineering warehouse in North Hollywood under the western approach to Bob Hope Airport (the Tujunga Building). Director Don Hall analogized the studio's relocation to the end of The Empire Strikes Back, where "you know they're going to get back together." The renovation was completed in October 2016. Walt Disney Animation Studios has produced animated features in a series of animation techniques, including traditional animation, computer animation, and animation combined with live-action scenes. The studio's first film, Snow White and the Seven Dwarfs, was released on December 21, 1937, and their most recent film, Ralph Breaks the Internet, was released on November 21, 2018. Since Alice Comedies in the 1920s, Walt Disney Animation Studios has produced a series of prominent short films, including the Mickey Mouse cartoons and the Silly Symphonies series. Many of these shorts provided a medium for the studio to experiment with new technologies that they would use in their filmmaking process, such as the synchronization of sound in Steamboat Willie (1928), the integration of the three-strip Technicolor process in Flowers and Trees (1932), the multiplane camera in The Old Mill (1937), the xerography process in Goliath II (1960), and the hand-drawn/CGI hybrid animation in Off His Rockers (1992), Paperman (2012), and Get a Horse! (2013). On August 18, 2015, Disney released twelve short animation films entitled: Walt Disney Animation Studios Short Films Collection which includes among others Tick Tock Tale (2010) directed by Dean Wellins and Prep & Landing - Operation: Secret Santa (2010) written and directed by Kevin Deters Stevie Wermers-Skelton. On March 22, 2017, the shorts included were released on Netflix. ^ a b "The Walt Disney Studios". The Walt Disney Company. Archived from the original on November 5, 2015. Retrieved July 7, 2013. ^ "Contact". Walt Disney Animation Studios. Retrieved August 3, 2014. ^ Yamato, Jen; Yamato, Jen (November 19, 2014). "Disney Animation's Andrew Millstein, Pixar's Jim Morris Upped To President". ^ a b Godfrey, Leigh (January 3, 2003). "David Stainton Named President, Disney Feature Animation". AWN News. Retrieved February 27, 2013. ^ "Our Studio". Walt Disney Animation Studios. Walt Disney. Retrieved November 24, 2017. Combining masterful artistry and storytelling with groundbreaking technology, Walt Disney Animation Studios is a filmmaker-driven animation studio responsible for creating some of the most beloved films ever made. Located in Burbank, WDAS continues to build on its rich legacy of innovation and creativity, stretching from the first fully-animated feature film, 1937's Snow White and the Seven Dwarfs, to 2013's Academy Award®-winning Frozen, the biggest animated film of all time. ^ "Walt Disney Animation Studios – Our studio". Walt Disney Animation Studios. Retrieved July 7, 2013. ^ "New iPad App Goes Behind the Scenes of Disney's Animated Features". The Hollywood Reporter. August 8, 2013. Retrieved August 6, 2014. ^ Cavalier, Stephen (2011). The World History of Animation. Berkeley, California: University of California Press. pp. 14–16. ISBN 9780520261129. ^ a b c d Barrier, Michael (September 16, 2003). Hollywood Cartoons: American Animation in Its Golden Age (1st ed.). Oxford University Press. pp. 84–86, 144–151. ISBN 0-19-516729-5. ^ Tumminello, Wendy (2005). Exploring Storyboarding. Clifton Park, NY: Thomson Delmar Learning. p. 20. ISBN 978-1-4018-2715-1. ^ Miller, Daniel (March 25, 2016). "You can get tattoos and photocopies in the Los Feliz building where Walt Disney once made magic". Los Angeles Times. Tribune Publishing. Retrieved April 11, 2016. ^ a b "Alice Gets Rolling". Walt Disney Family Museum. Archived from the original on October 1, 2015. Retrieved June 1, 2014. ^ "Oswald". Walt Disney Family Museum. Retrieved June 1, 2014. ^ "The Wait Disney Studios History". The Wait Disney Studios. Archived from the original on June 27, 2014. Retrieved June 1, 2014. ^ "A Famous Train Ride". Walt Disney Family Museum. Archived from the original on October 1, 2015. Retrieved June 2, 2014. ^ Solomon, Charles. "The Golden Age of Mickey Mouse". Disney. Archived from the original on March 1, 2007. Retrieved May 21, 2008. ^ "The Skeleton Dance Premieres". Walt Disney Family Museum. Archived from the original on September 26, 2015. Retrieved June 1, 2014. Holliss, Richard; Brian Sibley (1988). The Disney Studio Story. Building a Company – Roy O. Disney and the Creation of an Entertainment Empire, by Bob Thomas, 1998. Pg. 137. Walt Disney – The Triumph of the American Imagination, by Neal Gabler, 2006. Pg. 330. ^ "WaltandRoy Sign a New Deal". Walt Disney Family Museum. Archived from the original on October 1, 2015. Retrieved June 2, 2014. ^ "Ub Iwerks Resigns". Walt Disney Family Museum. Archived from the original on September 26, 2015. Retrieved June 1, 2014. ^ "Color Coming". Walt Disney Family Museum. Retrieved June 2, 2014. ^ a b c d e FilmmakerIQ: The History and Science of Color Film: From Isaac Newton to the Coen Brothers (Digital video). YouTube. 2013. Event occurs at 11:40. Retrieved June 22, 2014. ^ "Flowers and Trees". Walt Disney Family Museum. Archived from the original on September 26, 2015. Retrieved June 2, 2014. ^ "Flowers and Trees Wins an Academy Award®". Walt Disney Family Museum. Archived from the original on October 27, 2015. Retrieved May 10, 2014. ^ "Walt Disney at the Museum?". Montreal Museum of Fine Arts. Archived from the original on February 18, 2008. Retrieved May 21, 2008. ^ "Once Upon a Time: Walt Disney: The Sources of Inspiration for the Disney Studios". fps magazine. Retrieved May 21, 2008. ^ Danks, Adrian. "Huffing and Puffing about Three Little Pigs". Senses of Cinema. Archived from the original on August 29, 2011. Retrieved May 21, 2008. ^ Ehrbar, Greg (2006). Mouse Tracks: The Story of Walt Disney Records (First ed.). Jackson, MS: University Press of Mississippi. p. 6. ISBN 1617034339. Retrieved March 11, 2015. ^ a b c Thomas, Bob (1991). Disney's Art of Animation: From Mickey Mouse to Beauty and the Beast. New York. : Hyperion. p. 66. ISBN 1-56282-899-1. ^ "Multiplane Cameras". Animationschooldaily.com. September 21, 2012. Retrieved July 7, 2013. ^ a b Thomas, Bob. Walt Disney: An American Original. Simon & Schuster, 1976, p. 134. ^ "Cartoons that Time Forgot". Images Journal. Retrieved May 21, 2008. ^ a b Barrier 1999, p. 229. ^ "Donald Duck". Encyclopædia Britannica. Retrieved May 21, 2008. ^ "Silly Symphonies". Queensland Art Gallery. Archived from the original on March 20, 2013. Retrieved May 18, 2014. ^ "Disney History". The Walt Disney Company. Archived from the original on July 4, 2015. Retrieved May 21, 2014. ^ a b Barrier, Michael (1999). Hollywood Cartoons: American Animation in Its Golden Age. New York: Oxford University Press. pp. 269–273, 602. ISBN 0-19-516729-5. ^ Thomas, Bob (1994). Walt Disney: An American Original. New York: Hyperion Books. p. 161. ISBN 0-7868-6027-8. ^ Barrier, Michael (1999). Hollywood Cartoons: American Animation in Its Golden Age. New York: Oxford University Press. pp. 318, 602. ISBN 0-19-516729-5. ^ Roberts, David (2006). British Hit Singles and Albums. Guinness World Records Limited. p. 134. ISBN 978-1-904994-10-7. ^ a b Hall, Sheldon; Neale, Stephen (2010). Epics, Spectacles, and Blockbusters: A Hollywood History. Wayne State University Press. ISBN 978-0-8143-3008-1. ^ Gabler, Neal (2006). Walt Disney: The Triumph of the American Imagination. New York: Random House. p. 347. ISBN 978-0-679-75747-4. ^ a b c Barrier, Michael (2008). The Animated Man: A Life of Walt Disney. University of California Press. pp. 273–274. ISBN 978-0-520-25619-4. ^ a b c d e Gabler, Neal (2006). Walt Disney: The Triumph of the American Imagination. New York: Random House. pp. 356–370. ISBN 978-0-679-75747-4. ^ Holleran, Scott (June 1, 2006). "TCM's Leading Ladies, 'Dumbo' at the El Capitan". boxofficemojo.com. Retrieved March 3, 2010. ^ Monahan, Kathy. "Wartoons". The History Channel Club. Archived from the original on April 19, 2013. Retrieved February 26, 2013. ^ Robin Allan, Walt Disney and Europe, p. 175. ^ a b Block, Alex Ben; Wilson, Lucy Autrey, eds. (2010). George Lucas's Blockbusting: A Decade-By-Decade Survey of Timeless Movies Including Untold Secrets of Their Financial and Cultural Success. HarperCollins. p. 206. ISBN 978-0-06-177889-6. ^ "Cinderella". The Walt Disney Family Museum. Archived from the original on November 19, 2008. Retrieved January 24, 2009. ^ Gabler, Neal (2006). Walt Disney: The Triumph of the American Imagination. New York: Random House. pp. 476–478. ISBN 978-0-679-75747-4. ^ a b Shostak, Stu (03-28-2012). "Interview with Floyd Norman". Stu's Show. Retrieved June 22, 2014. ^ a b Newcomb, Horace (2000). Television: The Critical View. Oxford University Press. p. 27. ISBN 0-19-511927-4. ^ a b c Thomas, Bob (1994). Walt Disney: An American Original. New York: Hyperion Press. pp. 294–295. ISBN 0-7868-6027-8. ^ Thomas, Bob (1976). Walt Disney: An American Original (1994 ed.). New York: Hyperion Press. pp. 294–295. ISBN 0-7868-6027-8. ^ Norman, Floyd (August 18, 2008). "Toon Tuesday : Here's to the real survivors". Jim Hill Media. Retrieved February 13, 2010. ^ Lehman, Christopher. (2009) The Colored Cartoon: Black Representation in American Animated Short Films, 1907–1954. Amherst, MA: Univ. of Massachusetts Press. p. 117. ^ Hulett, Steve (June 4, 2014). "'Mouse in Transition': The Disney Animation Story Crew (Chapter 3)". Cartoon Brew. Retrieved July 15, 2014. ^ "One-foot Runaway Brain Mickey Toy". Cartoon Brew. Retrieved July 15, 2014. ^ Connelly, Brendon (February 8, 2012). "What Is Disney's Paperman? And When Will We See It?". Bleeding Cool. Retrieved February 9, 2012. ^ "Big Rental Pictures of 1964", Variety, January 6, 1965 p 39. Please note this figure is rentals accruing to distributors not total gross. ^ a b "Pooh Stories Enchant Several Generations of Children". Philippine Daily Enquirer. May 12, 2000. Retrieved June 22, 2014. ^ Krämer, Peter (2005). The New Hollywood: from Bonnie and Clyde to Star Wars. Wallflower Press. pp. 56. ISBN 978-1-904764-58-8. ^ a b c d e Maltin, Leonard (1987). Of Mice and Magic: A History of American Animated Cartoons. New American Library. pp. 75–80. ISBN 0-452-25993-2. ^ a b c d e f g h Thomas, Bob (1991). Disney's Art of animation: from Mickey Mouse to Beauty and the Beast. Hyperion. ^ Moorhead, Jim (December 16, 1983). "A real Christmas present from Disney". The Evening Independent. Retrieved June 28, 2014. ^ a b c d e f g h i j k l m n o p q r s t u v w x y z aa ab ac ad ae Hahn, Don (2009). Waking Sleeping Beauty (Documentary film). Burbank, California: Stone Circle Pictures/Walt Disney Studios Motion Pictures. ^ Buck, Jerry (July 18, 1977). "New blood warms Walt's factory". Montreal Gazette. Retrieved June 28, 2014. ^ a b Scott, Vernon (August 6, 1982). "Cartoons in trouble?". The Bulletin. Retrieved June 28, 2014. ^ a b Pond, Steve (February 21, 2014). "Why Disney Fired John Lasseter – And How He Came Back to Heal the Studio". The Wrap. Retrieved May 11, 2014. ^ a b Schlender, Brent (May 17, 2006). "Pixar's magic man". CNN Money. Retrieved April 20, 2012. ^ Paik, Karen (2007). To Infinity and Beyond! : The Story of Pixar Animation Studios. San Francisco: Chronicle Books. ISBN 978-0-8118-5012-4. ^ Price, David A. (2009). The Pixar Touch: The Making of a Company. New York: Vintage Books. ISBN 978-0-307-27829-6. ^ DeKinder, Mathew (October 5, 2012). "Burton resurrects boy and his dog story in 'Frankenweenie'". St. Louis Post-Dispatch. Retrieved May 11, 2014. ^ Vincent, Mal (October 7, 2012). "Disney embraces Tim Burton's taste for dark and quirky". The Virginian-Pilot. Archived from the original on May 12, 2014. Retrieved May 11, 2014. ^ Jr, Tom Huddleston (June 15, 2018). "How 'Incredibles 2' director Brad Bird got his start at Disney". www.cnbc.com. ^ a b Kunz, William M. (2007). Culture Conglomerates: Consolidation in the Motion Picture and Television Industries. Lanham, Maryland: Rowman & Littlefield. pp. 41–42. ISBN 978-0-742-54066-8. ^ a b Stewart, James (2005). DisneyWar. New York: Simon & Schuster. ISBN 0-684-80993-1. ^ Singer, Barry (October 4, 1998). "THEATER; Just Two Animated Characters, Indeed". New York Times. Retrieved August 2, 2015. ^ Shaffer, Joshua C. (September 22, 2010). Discovering the Magic Kingdom: An Unofficial Disneyland Vacation Guide. Author House. p. 67. ^ "Don Bluth Biography". Retrieved September 13, 2009. ^ "Disney to axe Sydney studio". The Sydney Morning Herald. July 26, 2005. Retrieved March 12, 2013. ^ Norman Kagan (May 2003). "Who Framed Roger Rabbit". The Cinema of Robert Zemeckis. Lanham, Maryland: Rowman & Littlefield. pp. 93–117. ISBN 0-87833-293-6. ^ "The 72nd Academy Awards (2000) Nominees and Winners". The Academy of Motion Picture Arts and Sciences. Archived from the original on May 2, 2011. Retrieved September 28, 2011. The film won for Best Editing, Best Visual Effects, and Best Sound Editing. ^ Richardson, John (July 9, 1989). "Young Animator makes First Disney Short in 23 Years". Los Angeles Daily News. Retrieved June 22, 2014. ^ Telotte, J.P. (2010). Animating Space: From Mickey to WALL-E. Lexington, Kentucky: University Press of Kentucky. p. 296. ISBN 0813133718. ^ Drees, Rich. "Disney Closes Florida Animation Studio". filmbuffonline.com. Retrieved December 6, 2012. ^ "The 62nd Academy Awards (1990) Nominees and Winners". Academy of Motion Picture Arts and Sciences. Retrieved September 28, 2011. ^ Malach, Maggie (April 14, 2014). "Disney Renaissance: Why 'Frozen' Is Reviving the Company's Golden Era of Animated Films Read More: Disney Renaissance: Why 'Frozen' Is Reviving the Golden Era". PopCrush. Retrieved June 28, 2014. ^ "Beauty and the Beast – Film Archives". The Film Archives.com. Retrieved January 13, 2009. ^ "The 64th Academy Awards (1992) Nominees and Winners". Academy of Motion Picture Arts and Sciences. Retrieved September 28, 2011. ^ a b c d e f g h i j k l m n o p q r s t Lund, Dan (2005). Dream on Silly Dreamer (Documentary film). Orlando, Florida: WestLund Productions. ^ "Aladdin box office info". Box Office Mojo. Archived from the original on February 15, 2009. Retrieved March 17, 2009. ^ "The 65th Academy Awards (1993) Nominees and Winners". Academy of Motion Picture Arts and Sciences. Retrieved September 28, 2011. ^ a b c Butler, Robert (July 30, 2006). "High profile names help market animated films". The Victoria Advocate/McClatchy Newspapers. Retrieved June 22, 2014. ^ "Highest-grossing animated films". Box Office Mojo. Retrieved December 24, 2009. ^ "1992 Yearly Box Office Results". Box Office Mojo. Retrieved January 8, 2010. ^ "1994 Yearly Box Office Results". Box Office Mojo. Retrieved January 8, 2010. ^ Mendelson, Scott (October 15, 2013). "'Nightmare Before Christmas' Turns 20: From Shameful Spawn To Disney's Pride". Forbes. Retrieved December 14, 2013. ^ a b c d Swarden, Anne (July 1, 1997). "Parisian Moviegoers Flock To See Hunchback". The Washington Post. Retrieved June 22, 2014. ^ a b Breznican, Anthony (February 17, 2002). "The Boy Who Never Grew Up Makes Comeback in Disney's 'Peter Pan' Sequel". Retrieved June 22, 2014. ^ "Toy Story Reviews". Metacritic. Retrieved March 11, 2009. ^ "Toy Story (1995)". Rotten Tomatoes. Retrieved March 11, 2009. ^ "Toy Story". Box Office Mojo. Retrieved February 18, 2010. ^ a b Koenig, David (2011). "8". Mouse Under Glass: Secrets of Disney Animation & Theme Parks (2nd edition, Kindle ed.). Bonaventure Press. ^ Betsky, Aaron (December 18, 1994). "DREAM FACTORIES : Cartoon Character". Los Angeles Times. Retrieved September 25, 2017. ^ "Pocahontas". Box Office Mojo. Retrieved August 3, 2014. ^ "The 68th Academy Awards (1995) Nominees and Winners". Academy of Motion Picture Arts and Sciences. Retrieved September 28, 2011. . Pocahontas won two 1996 Academy Awards for Best Original Score and Best Original Song. ^ "The Hunchback of Notre Dame". Box Office Mojo. Retrieved August 3, 2014. ^ "Hercules". Box Office Mojo. Retrieved August 3, 2014. ^ "Hercules (1997)". Rotten Tomatoes. Retrieved August 14, 2015. ^ a b Lund, Dan (2005). "The 'Story Department' Sequence: Super Sized". Bonus features for Dream On Silly Dreamer (Documentary film) DVD release. Orlando, Florida: WestLund Productions. Extended interviews with several former Disney Feature Animation employees discussing changes to the studio's story development processes between 1999 and 2004. Mulan and My Peoples (also known as A Few Good Ghosts) are discussed at length by director Barry Cook. ^ "Letter of Support to Roy E. Disney and Stanley Gold from the Animation Community". Save Disney. December 2, 2003. Archived from the original on February 6, 2004. Retrieved August 3, 2014. ^ "Animated Films Fuel Disney Success". Orlando Sentinel. May 29, 1994. Retrieved June 22, 2014. ^ "Tarzan". Box Office Mojo. Retrieved August 3, 2014. ^ "The 72nd Academy Awards (2000) Nominees and Winners". Academy of Motion Picture Arts and Sciences. Retrieved September 28, 2011. ^ "Studio Shakeups". VFX HQ Spotlight. April 1996. Retrieved February 23, 2013. ^ McNary, Dave (October 28, 1999). "DISNEY, DQI TO FORM THE SECRET LAB". Daily News. Los Angeles, CA. Retrieved February 23, 2013. ^ "Dinosaur (2000)". Box Office Mojo. Retrieved November 25, 2016. ^ Graser, Marc (October 23, 2001). "Disney can't keep Secret". Variety. Retrieved August 23, 2012. ^ a b Brennan, Judyr (August 19, 1997). "Coming, Sooner or Later". Los Angeles Times. Retrieved May 6, 2011. ^ Zager, Michael (November 11, 2011). Music Production: For Producers, Composers, Arrangers, and Students (2 ed.). Scarecrow Press. p. xxv. ISBN 0-810-88202-7. ^ Interview with Michael Eisner (Digital). Archive of American Television. 2006. ^ a b Orwall, Bruce (June 19, 2002). "Disney Revamps Cartoon Department". Lakeland Ledger, syndicated from The Wall Street Journal. Retrieved June 27, 2014. ^ Holson, Laura (March 19, 2002). "Disney Is Cutting 250 Jobs at Animation Unit". Retrieved June 22, 2014. ^ Loinas, Alexis (January 6, 2001). "The Emperor's New Groove: A Disappointing Disney Movie the Mouse House Can't Save". Philippine Daily Enquirer. Retrieved June 22, 2014. ^ "The Emperor's New Groove (2000)". Box Office Mojo. Retrieved August 3, 2014. ^ "The Emperor's New Groove (2000)". Rotten Tomatoes. Retrieved August 3, 2014. ^ "The Year in Video 2001: The Year in Charts". Billboard. Nielsen Business Media. 114 (2): 67. January 12, 2002. The Emperor's New Groove was the top-selling video release of 2001. ^ "Atlantis: The Lost Empire". Box Office Mojo. Retrieved August 3, 2014. ^ a b c d e "Disney-Pixar split heightens pressure for new hits". The Hour. Associated Press. January 30, 2004. Retrieved June 27, 2014. ^ a b c d Lloyd, Christopher (June 19, 2002). "Lilo's Creators: Orlando animators bring back watercolors for Lilo & Stitch". Ocala Star-Banner. Retrieved June 27, 2014. ^ a b Lund, Dan (2005). "The 'Meeting' Sequence: Super Sized". Bonus features for Dream On Silly Dreamer (Documentary film) DVD release. Orlando, Florida: WestLund Productions. Extended interviews with former Disney Feature Animation artists about the WDFA staff meetings during the week of March 19–25, 2002 with Feature Animation president Thomas Schumacher and producer Alice Dewey where the layoffs and move of the Burbank studio to CGI are discussed at length. ^ Verrier, Richard; Claudia Eller (September 29, 2003). "Disney Pushed Toward Digital". Los Angeles Times. Retrieved March 23, 2013. ^ "Treasure Planet (2002)". Box Office Mojo. Retrieved November 25, 2016. ^ a b Friedman, Jake (June 2006). "Dream on Silly Dreamer". FPS Magazine. Archived from the original on July 14, 2014. Retrieved July 7, 2014. ^ Linder, Brian (November 29, 2000). "Disney Wrangles Cuba, Dame Judi Dench for Sweating Bullets". IGN. Retrieved March 4, 2016. ^ "Lilo and Stitch (2002)". Box Office Mojo. Retrieved August 4, 2014. ^ Baisley, Sarah (June 16, 2003). "DisneyToon Studios Builds Slate Under New Name and Homes for Needy". Animation World Network. Retrieved February 26, 2013. ^ a b c "Disney pulls its animators from Orlando". St. Petersberg Times. Associated Press. January 13, 2004. Retrieved June 27, 2014. ^ Verrier, Richard (April 6, 2004). "'Range' Is Not Looking Idyllic". Los Angeles Times. Retrieved March 4, 2016. ^ Verrier, Richard (September 11, 2012). "Digital media trailblazer and ex-Disney exec Bob Lambert dies". Los Angeles Times Company Town. Retrieved October 2, 2012. ^ a b Graham, Bill (November 27, 2010). "Animation Director Glen Keane Exclusive Interview TANGLED". Collider.com. Collider.com, LLC. Retrieved May 11, 2014. ^ "Chicken Little (2005)". Box Office Mojo. Retrieved August 4, 2014. ^ "Chicken Little (2005)". Rotten Tomatoes. Retrieved August 4, 2014. ^ a b Eller, Claudia (January 26, 2006). "Deal Ends Quarrel Over Pixar Sequels". Los Angeles Times. Retrieved February 21, 2013. ^ "Walt Disney Company, Form 8-K, Current Report, Filing Date Jan 26, 2006" (PDF). secdatabase.com. Retrieved May 12, 2018. ^ a b "Walt Disney Company, Form 8-K, Current Report, Filing Date May 8, 2006". secdatabase.com. Retrieved May 12, 2018. ^ a b "Disney buying Pixar for $7.4 billion". NBC News. AP. January 1, 2006. Retrieved February 28, 2013. ^ Daly, Steve (June 16, 2006). "Woody: The Untold Story". Entertainment Weekly Magazine. Retrieved February 21, 2013. ^ Eller, Claudia; Richard Verrier (March 16, 2005). "Disney Plans Life After Pixar With Sequel Unit". Los Angeles Times. Retrieved February 21, 2013. Disney animation chief David Stainton, to whom the sequels unit reports, declined to comment on its plans. ^ "Disney Closes Unit Devoted to Pixar Sequels". Los Angeles Times. March 21, 2006. Retrieved October 30, 2011. ^ Barnes, Brooks (March 4, 2014). "At Disney, a Celebration That Was a Long Time Coming". New York Times. Retrieved April 5, 2014. ^ a b Wloszczyna, Susan (October 31, 2012). "'Wreck-It Ralph' is a Disney animation game-changer". USA Today. Retrieved April 5, 2014. ^ a b Williams, Christopher (March 31, 2014). "'The world is a better place with Disney animation in it': John Lasseter tells the Telegraph how he saved Disney Animation Studios from the doldrums". The Daily Telegraph. Retrieved April 23, 2014. ^ Bell, Chris (April 25, 2014). "Pixar uneasy atop its pedestal: For the first time in nearly 10 years the animation studio won't be releasing a film this year". Calgary Herald. Archived from the original on May 9, 2014. Retrieved May 9, 2014. ^ Solomon, Charles (2013). The Art of Frozen. San Francisco: Chronicle Books. ISBN 978-1-4521-1716-4. ^ Bell, Chris (April 5, 2014). "Pixar's Ed Catmull: interview". The Daily Telegraph. Retrieved April 5, 2014. ^ Zahed, Ramin (April 2, 2012). "An Interview with Disney/Pixar President Dr. Ed Catmull". Animation Magazine. Retrieved April 5, 2014. ^ a b Debruge, Peter (November 23, 2016). "Disney's Pixar Acquisition: Bob Iger's Bold Move That Reanimated a Studio". Variety. Retrieved November 24, 2016. ^ Pond, Steve (February 21, 2014). "Why Disney Fired John Lasseter – And How He Came Back to Heal the Studio". The Wrap. Retrieved April 5, 2014. ^ Keegan, Rebecca (May 9, 2013). "Disney is reanimated with 'Frozen,' 'Big Hero 6'". Los Angeles Times. Retrieved April 21, 2014. ^ a b Lark, Max; Draskovic, Marina; Solomon, Charles (Spring 2016). "It's a Matter of Trust: At Walt Disney Animation Studios, The 'Story Trust,' A Peer-to-Peer Feedback System, Has Taken Storytelling—And Disney Animation—To New Creative Heights". Disney twenty-three. Burbank: Walt Disney Company. 8 (1): 18–21. ISSN 2162-5492. OCLC 698366817. ^ Kilday, Gregg (December 4, 2013). "Pixar vs. Disney Animation: John Lasseter's Tricky Tug-of-War". The Hollywood Reporter. Retrieved December 4, 2013. ^ Armstrong, Josh (April 22, 2013). "From Snow Queen to Pinocchio II: Robert Reece's animated adventures in screenwriting • Animated Views". Animatedviews.com. Retrieved July 7, 2013. ^ Ghez, Didier (2011). Walt's People: Talking Disney With the Artists Who Knew Him (Google eBook). Xlibris Corporation. pp. 602–613. ^ "Meet the Robinsons (2007)". Box Office Mojo. Retrieved March 29, 2016. ^ "DisneyToon Studios to be Restructured and Will Operate as a Separate Unit/ BURBANK, Calif., June 22". PRNewswire. Retrieved July 7, 2013. ^ Sciretta, Peter (June 20, 2008). "Bolt Teaser Poster; A Look Back at American Dog". Slashfilm. Retrieved June 28, 2014. ^ Giardina, Carolyn (July 22, 2013). "Siggraph: Chris Sanders Talks 'Croods 2,' 'Dragon 2' and Why He Loves Animated Sequels". The Hollywood Reporter. Retrieved June 28, 2014. ^ "Bolt". Rotten Tomatoes. Retrieved August 4, 2014. ^ a b "At Disney, a Celebration That Was a Long Time Coming". New York Times. March 4, 2014. Retrieved June 28, 2014. ^ Orange, B. Alan (March 13, 2010). "John Lasseter Returns to Hand Drawn Animation with The Princess and the Frog". movieweb. Retrieved January 8, 2011. ^ ""The Hurt Locker" Takes Top Honors at 82nd Academy Awards". playbill.com. Playbill. Retrieved February 23, 2015. ^ Dawn C. Chmielewski; Claudia Eller (March 9, 2010). "Disney restyles 'Rapunzel' to appeal to boys". Los Angeles Times. Retrieved January 20, 2014. ^ Sciretta, Peter (December 22, 2011). "Walt Disney Animation Gives 'The Snow Queen' New Life, Retitled 'Frozen' – But Will It Be Hand Drawn?". SlashFilm. Retrieved January 20, 2014. ^ "How did Rapunzel become 'Tangled'? Directors Nathan Greno and Byron Howard set the record straight". Entertainment Weekly. Time Inc. Retrieved January 1, 2014. ^ "Disney seeks to crown revival with 'Frozen' Oscar gold". National Media. Retrieved June 22, 2014. ^ Seldman, Robert (December 9, 2009). "Debut of Disney Holiday Special "Prep & Landing" Scores Big for ABC". TVByTheNumbers. Retrieved June 28, 2014. ^ Graser, Marc (September 11, 2009). "Disney in cartoon deal with Del Toro". Variety. Retrieved September 20, 2016. ^ McClintock, Pamela (July 22, 2010). "Helmer to haunt Disney's 'Mansion'". Variety. Retrieved September 20, 2016. ^ Debruge, Peter (June 4, 2012). "Del Toro bullish on several projects". Variety. Retrieved September 20, 2016. ^ "Tangled Movie Reviews". Rotten Tomatoes. Flixster. Retrieved November 19, 2010. ^ Fritz, Ben (November 28, 2010). "Box office: 'Tangled' feasts as 'Burlesque', 'Faster', 'Love & Other Drugs' fight for leftovers". Los Angeles Times. Retrieved February 16, 2011. ^ "WORLDWIDE GROSSES". Box Office Mojo. Retrieved April 25, 2011. ^ a b Taylor, Drew. "Disney CEO Bob Iger Says There Are No Current Plans For Hand Drawn Animation – But What Does He Really Mean?". IndieWire. Archived from the original on March 15, 2013. Retrieved March 7, 2013. ^ Han, Angie (March 14, 2011). "First Look and Early Buzz: Disney's Hand-drawn Short 'The Ballad of Nessie'". Slashfilm. Retrieved June 17, 2018. ^ a b Barnes, Brooks (March 4, 2014). "At Disney, a Celebration That Was a Long Time Coming". The New York Times. Retrieved March 5, 2014. ^ King, Susan (February 2, 2013). "40th Annie Award nominees and winners list". Los Angeles Times. Retrieved February 3, 2013. ^ Globe, Golden (December 13, 2012). "Golden Globes 2013: full list of nominations". guardian.co.uk. Retrieved January 3, 2013. ^ "'2013 Oscar Nominees". Academy of Motion Picture Arts and Sciences. January 10, 2013. Archived from the original on January 10, 2013. Retrieved February 3, 2013. ^ Amidi, Amid. "Disney Sweeps Animation Oscars with "Paperman" and "Brave"; VFX Oscar Goes to "Life of Pi"". Cartoon Brew. Cartoon Brew LLC. Retrieved June 25, 2013. ^ a b c MacQuarrie, Jim (November 2, 2012). "Disney's Paperman Is a Perfect Short Film". Wired. Archived from the original on June 5, 2013. Retrieved June 25, 2013. ^ Amidi, Amid (April 11, 2013). "BREAKING: Disney Just Gutted Their Hand-Drawn Animation Division (UPDATED)". Cartoon Brew. Retrieved June 30, 2013. ^ Keegan, Rebecca (May 9, 2013). "Disney is reanimated with films such as 'Big Hero 6,' 'Frozen'". latimes.com. Retrieved July 7, 2013. ^ a b Zuckerman, Esther (November 4, 2013). "Is 'Frozen' a New, Bona Fide Disney Classic?". The Atlantic Wire. Retrieved December 20, 2013. ^ "Box Office Milestone: 'Frozen' Crosses $1 Billion Worldwide". hollywoodreporter.com. Retrieved March 2, 2014. ^ Richwine, Lisa. "Disney's 'Frozen' wins animated feature Oscar". Reuters. Retrieved March 3, 2014. ^ a b Breznican, Anthony (August 22, 2013). "Old-school Mickey Mouse gets future shock in Get a Horse! – First Look". Entertainment Weekly. Retrieved August 22, 2013. ^ Keegan, Rebecca (May 9, 2013). "Exclusive: Disney Animation announces first Marvel movie, 'Big Hero 6′". The Los Angeles Times. Retrieved May 9, 2013. ^ Miller, Daniel (February 20, 2015). "Software behind 'Big Hero 6' pushes envelope on computer animation". Los Angeles Times. Retrieved March 8, 2016. ^ "Big Hero 6 (2014)". Rotten Tomatoes. ^ "Big Hero 6 Reviews". Metacritic. Retrieved December 16, 2014. ^ Kinsey Lowe (March 13, 2015). "'Big Hero 6′: No. 1 Animated Movie Worldwide 2014". Deadline Hollywood. Retrieved March 15, 2015. ^ "Oscars 2015: 'Birdman' wins Best Picture". Entertainment Weekly. February 22, 2015. Retrieved February 23, 2015. ^ Graser, Marc (September 2, 2014). "Disney Reveals Next Three Animated Shorts". Variety. Retrieved October 1, 2014. ^ Clark, Noelene (February 22, 2015). "Oscars 2015: 'Feast' wins for animated short". Los Angeles Times. Retrieved February 22, 2015. ^ McNary, Dave (June 11, 2015). "Watch: Disney's 'Zootopia' Trailer Introduces Animal-Run World". Variety. Retrieved March 7, 2016. ^ "Zootopia (2016)". Rotten Tomatoes. ^ Lang, Brent (March 6, 2016). "'Zootopia' Box Office Success Proof of Disney Animation Renaissance". Variety. Retrieved June 30, 2016. ^ Coggan, Devin (June 6, 2016). "Zootopia hits $1 billion worldwide". Entertainment Weekly. Retrieved June 30, 2016. ^ McNary, Dave (February 26, 2017). "'Zootopia' Wins Oscar for Best Animated Feature Film". Variety. Retrieved February 26, 2017. ^ Khatchatourian, Maane (June 13, 2016). "'Moana': Polynesian Princess Not Impressed by Dwayne Johnson's Maui in First Teaser". Variety. Retrieved November 22, 2016. ^ Snetiker, Marc (November 18, 2016). "Go inside the human body in Disney's new short film before Moana — exclusive". Entertainment Weekly. Retrieved November 22, 2016. ^ Dave McNary (March 16, 2017). "Disney's 'Moana' Sails to $600 Million at Worldwide Box Office". Variety. Retrieved March 16, 2017. ^ Barnes, Brooks (June 8, 2018). "Pixar Co-Founder to Leave Disney After 'Missteps'". The Hollywood Reporter. Retrieved June 8, 2018. ^ a b Kit, Borys (June 19, 2018). "Pete Docter, Jennifer Lee to Lead Pixar, Disney Animation". The Hollywood Reporter. Retrieved June 19, 2018. ^ Desowitz, Bill (June 28, 2018). "Disney Shuts Down Disneytoon Studios in Glendale: Exclusive". IndieWire. Retrieved June 29, 2018. ^ Kit, Borys (October 23, 2018). "Pixar Co-Founder Ed Catmull to Retire". The Hollywood Reporter. Retrieved October 24, 2018. ^ McNary, Dave (June 4, 2018). "Vanellope Meets Disney Princesses in New 'Wreck-It Ralph 2' Trailer". Variety. Retrieved November 21, 2018. ^ Scott Mendelson (February 17, 2019). "Box Office: 'How To Train Your Dragon 3' Tops $170M, 'Wandering Earth' Tops $560M". Forbes. Retrieved March 3, 2019. And Walt Disney's Ralph Breaks the Internet has now earned $505m worldwide. So, expectations notwithstanding, it's arguably a hit. ^ Scott Mendelson (March 3, 2019). "Box Office: 'Green Book' Scores In China, 'Bohemian Rhapsody' Tops 'Solo: A Star Wars Story'". Forbes. Retrieved March 3, 2019. And Ralph Breaks the Internet was also a Best Animated Feature nominee, so I should note that it crossed $200 million domestic yesterday. The $165m-budgeted Disney sequel has earned $515m worldwide, which is a pretty solid sum. It again shows that a Disney sequel isn't necessarily going to perform even as well as a Disney "original" like Coco or Moana, but that's for another day. ^ Brad Brevet (March 3, 2019). "'How to Train Your Dragon 3' Holds off Madea's 'Family Funeral' at Box Office". Box Office Mojo. Retrieved March 3, 2019. Lastly, Disney's Ralph Breaks the Internet finally topped $200 million domestically this weekend after having already outperformed the first film, which reached $189.4 million domestically back in 2012. Internationally, the Ralph sequel is now just shy of $320 million for a global cume totaling $520 million. The first film finished with over $471 million globally. ^ Graser, Marc (November 18, 2014). "Walt Disney Animation, Pixar Promote Andrew Millstein, Jim Morris to President". Variety. Retrieved November 18, 2014. ^ Graser, Marc (September 10, 2008). "Millstein to head Disney Animation". Variety. Retrieved September 10, 2008. ^ Amidi, Amid (January 24, 2006). "David Stainton Out!". Cartoon Brew. Retrieved December 10, 2012. ^ "Roy E Disney Feature Animation Building: Dedication and tribute open to limited number of guests". Inside the Magic. April 2013. Retrieved November 19, 2013. ^ Rea, Steven (July 20, 2003). "No-more-pencils animation". Philadelphia Inquirer. Interstate General Media. Archived from the original on January 9, 2016. Retrieved December 8, 2014. ^ Anonymous (June 20, 1997). "Disney Buys 96 Acres in Glendale". Los Angeles Times. The Times Mirror Company. Retrieved December 8, 2014. ^ "Disney Animation Research Library". ILoveLibraries.org. Retrieved June 28, 2014. ^ a b McLean, Craig (July 30, 2013). "The Jungle Book: the making of Disney's most troubled film". The Daily Telegraph. Retrieved May 11, 2014. ^ Gardner, Chris (November 22, 2014). "Roy E. Disney Animation Building Getting a Makeover". The Hollywood Reporter. Prometheus Global Media LLC. Retrieved December 8, 2014. ^ a b Frye, Jim (Spring 2016). "Remodeling Disney Animation". Disney twenty-three. Burbank: Walt Disney Company. 8 (1): 4–9. ISSN 2162-5492. OCLC 698366817. ^ Catmull, Ed; Amy Wallace (2014). Creativity, Inc.: Overcoming the Unseen Forces That Stand in the Way of True Inspiration. New York: Random House. pp. 253–254. ISBN 978-0812993011. ^ a b Rottenberg, Josh (February 7, 2015). "Disney's animation building getting a Pixar face-lift all its own". Los Angeles Times. Tribune Publishing Company. Retrieved February 9, 2015. ^ a b Snetiker, Marc (24 November 2016). "Moana directors Ron Clements, John Musker talk four decades Disney movies". Entertainment Weekly. New York: Time Inc. Retrieved 13 January 2017. ^ Barrier, Michael. Hollywood Cartoons: American Animation in Its Golden Age. New York: Oxford University Press. p. 229. ISBN 0-19-516729-5. ^ Lang, Brent (November 10, 2014). "Disney Animation's 'Zootopia,' 'Moana' Hitting Theaters in 2016". Variety. Retrieved November 10, 2014. ^ Cohen, Karl (January 2000). "Milestones of the Animation Industry in the 20th Century". Animation World Magazine. Archived from the original on October 16, 2014. Retrieved June 28, 2014. ^ Hinman, Catherine (July 15, 1992). "How The Disney Film Short 'Off His Rockers' Made It to the Big Screen: A Little Project That 'blew Up.'". Orlando Sentinel. Retrieved June 28, 2014.